Also serving communities of Lexington. There are 5 Memory Care Facilities in the Blue Springs area, with 2 in Blue Springs and 3 nearby. 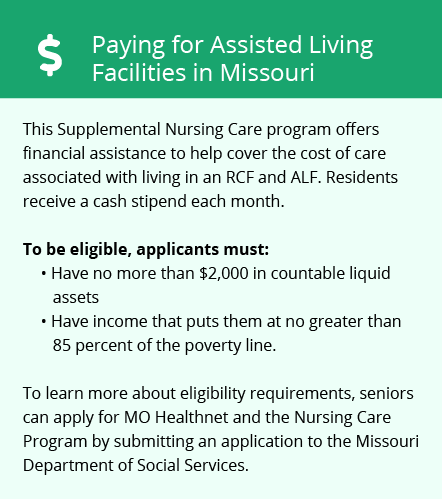 The average cost of memory care in Blue Springs is $5,597 per month. This is higher than the national median of $4,650. To help you with your search, browse the 1 review below for memory care facilities in Blue Springs. Better rated regions include Independence with an average rating of 5.0 out of 5 stars. Caring.com has helped thousands of families find high-quality senior care. To speak with one of our Family Advisors about memory care options and costs in Blue Springs, call (855) 863-8283. Blue Springs, Missouri, sits near the Kansas border and has approximately 55,000 residents, about 12 percent seniors at least 65 years old. Seniors with cognitive conditions such as dementia and Alzheimer's disease can seek treatment from four memory care facilities in the Blue Springs area or over two dozen facilities in the nearby Kansas City region. The Missouri facilities that care for patients with Alzheimer's disease and similar conditions are called Residential Care Facilities (RCFs) or Assisted Living Facilities. Blue Springs is home to world-class medical facilities, including those specializing in brain health and dementia care such as St. Mary's Medical Center, in the event of medical emergencies or illness. Seniors seeking memory care facilities in Blue Springs should consider the city's fluctuating temperatures, which typically range from 23 to 89 degrees throughout the year. The weather is often dreary and rainy in the fall, but sunshine usually brightens the skies during summertime. Snow, ice and frost coat the ground on chilly winter days, but warmer temperatures arrive during mid-to-late spring. Families may want to consider a memory care facility with plenty of indoor space for activities so their loved one can avoid rain, wind or snow. The crime rate is high in Blue Springs, but property crimes are more common than violent attacks. Missouri residents have a one in 189 chance of experiencing violence, but the risk drops to just one in 458 for Blue Springs residents. Despite this decreased risk, families with seniors prone to wandering should inquire about surveillance systems and security procedures to keep their loved one safe. With a score of 99, Blue Springs fall just under the 100-point U.S. average for living expenses. However, the cost of living for Blue Springs residents is slightly higher than the Missouri average. Housing, utilities and transportation expenses are often higher in Blue Springs than other parts of Missouri, but residents enjoy lower grocery prices. Memory Care costs in Blue Springs start around $5,597 per month on average, while the nationwide average cost of memory care is $4,799 per month. It’s important to note that memory care rates in Blue Springs and the surrounding suburbs can vary widely based on factors such as location, the level of care needed, apartment size and the types of amenities offered at each community. Blue Springs and the surrounding area are home to numerous government agencies and non-profit organizations offering help for seniors searching for or currently residing in an assisted living community. These organizations can also provide assistance in a number of other eldercare services such as geriatric care management, elder law advice, estate planning, finding home care and health and wellness programs. To see a list of free memory care resources in Blue Springs, please visit our Assisted Living in Missouri page. 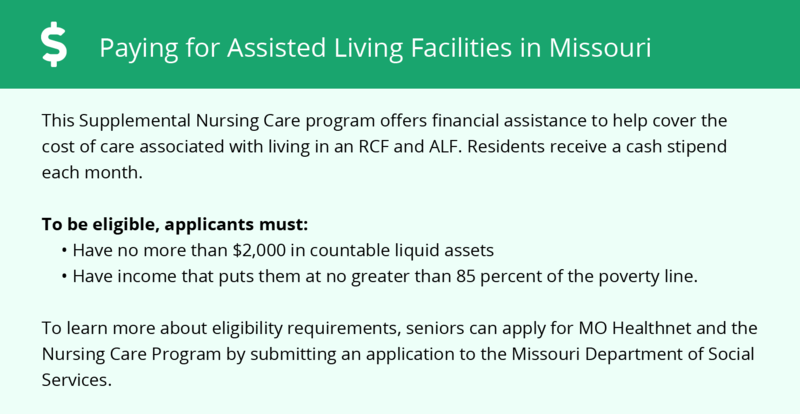 Blue Springs-area assisted living communities must adhere to the comprehensive set of state laws and regulations that all assisted living communities in Missouri are required to follow. Visit our Memory Care in Missouri page for more information about these laws.